Truffle mushrooms are round, knobby belowground fruiting bodies. They come in different colors and sizes, usually black, white, yellow, or brown. They can be smooth to warty in texture on their outer surface. Truffle are the members in the Tuberaceae family of fungi; of the genus, Tuber. When truffles mature, they produce aromatic compounds that attract animals like dogs and small mammals. The fungus lives in a mutually beneficial relationship with the roots of some trees. This symbiotic association called ectomycorrhizae. In this relationship the fungi form a network with their hyphae around and in between the outermost layers of the tree's root cells. Truffles are quite unique in feature that separates them from other common fungi. Truffle has a rounded, below the earth fruiting body that can be lobed, with shallow to deep furrows and has yellowish, tan to dark brown skin. The interior is solid, white, marble like in white species and black in black species with narrow, white veins that tend to radiate from the base. Mature specimens possess a pungent, rich smell. Several species of tuber (truffle) mushrooms found naturally in the dense forests of Northern Hemisphere, especially Italy, Balkans, and France. 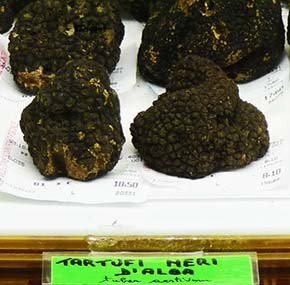 The black perigord (French black) truffle (Tuber melanosporum) is mainly found the wooden forests of Southern Europe. They feature mottling pattern with streaks of white veins. They are the most sought after by the chefs all over the world for its very aromatic flesh. Other important black species are black summer truffle (T. aestivum) and Burgundy truffles (T. uncinatum) are also prized for their culinary values. 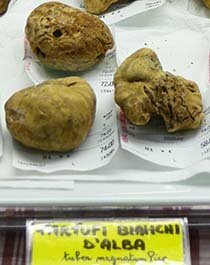 The white truffles (T. magnatum) are the largest of truffles and found in the Northern Italy. White truffles are also highly accolade by the chefs for their powerful fragrance likened to mould, garlic, and smell of cheese. Some other species include those found in the US such as Oregon black truffle (T. gibbosum), Oregon brown truffle are also noted for their culinary values. Pecan truffle (T. lyoni) is found in the southern part of United States near the pecan tree cultivation. Truffle perhaps nutritionally unimportant mushrooms for they used in very limited amounts as food. Nonetheless, this flavorful forest mushroom add distinctive sensory qualities to the food, and thus, contributes to the enrichment of its nutritional value. Truffle's aroma comes from certain volatile organic compounds (VOC's) like aromatic hydrocarbons, phenols, sulphur compounds, and terpenes. Some of the organic aromatic compounds are methy propanol, methylbutanal acetaldehyde, butanedione (buttery), and bis-(methylthio) methane (garlic-like) which give truffle . Black truffles were described in the traditional medicines to be an aphrodisiac. Truffles also contain good amounts of easily digestible natural proteins. They add some minerals and vitamins, albeit in minute quantities to the food. Truffles are grown the wild close to oak, poplar, hazelnut, elm, pecans and beech trees. Mature truffles develop odors and emit volatile organic compounds and pheromones that attract wild animals. Truffle hunters search for them from autumn to winter with the help of trained dogs in these wooded forests. Some truffle enthuasiats may resort to raking method to unearth prized truffles. However, this method can damage the mature truffles, inflicting cut injuries on them and decrease their market value. Also, raking dislodges other unripe truffles from the support network with their host trees, and thus ending their maturation process. Fresh truffles are usually sold in the areas from which they are harvested. Choose firm, fleshly truffles, without bruises. In the markets one can choose dried truffles in airtight containers. Other novelty products such as truffle flavored sugar, salt, truffle honey, truffle oil, etc can also be found in the supermarkets. Truffles canned in water are also available in some stores. Eat them as soon as possible. To store, place them in the fridge fresh up to 1 week. Place cut truffles in an airtight container and cover them with Madeira or white wine. Canned truffles that are cut and covered with Madeira or a little oil for a month. Truffle's rarity in the nature makes them the most expensive items to use liberally in the dishes. Their usefulness counted just as gourmet food and to some extent as appetizer. Do not wash truffles -rub them gently with a soft brush. Cut them in slices, slivers, cubes or shaving. Truffles are used raw, or cooked; in the form of a concentrate, juice, funet (reduced stock) or essense. They can flavor salads, stuffing, sauces, pasta dishes, rice and eggs. Truffles slices imbedded in game and poultry, especially the Charismas turkey. A few slivers are enough to flavor a whole dish. 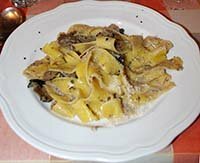 Tagliatelle, the classic pasta of Italy's Emilia-Romagna region, is a long, flat ribbons-like pasta seasoned/flavored with permesan cheese and truffle sauce. Bolete mushroom nutrition facts and health benefits. Button mushrooms nutrition facts and health benefits. Morels nutrition facts and health benefits. Shiitake mushrooms nutrition facts and health benefits. <<-Back to Mushrooms from Truffle mushroom. Visit here for an impressive list of edile mushrooms with complete illustrations of their nutrition facts and health benefits.